The three under-slide bay doors on my coach all have weak gas springs. The doors stop well short of opening to the horizontal position. There have been threads here before on this topic, but it is unclear/unmentioned if anyone proceeded to replace any struts. Since they differ from all other birds the topic is also not well understood by most here. 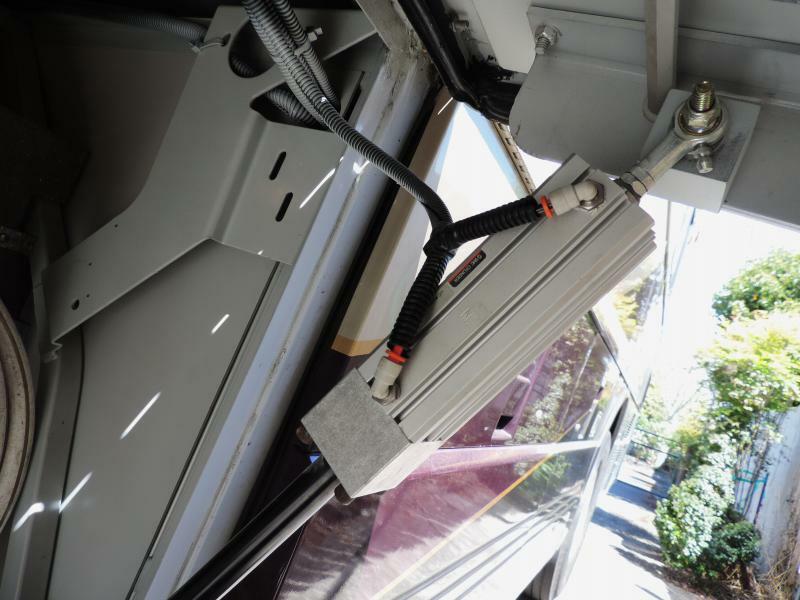 What is on the OEM bus: Each door has two struts. One is an AVM 80 lb strut with 15-inches of stroke. Probably relatively easy to replace. The other is a hybrid strut consisting of an 80 lb AVM 10-inch-stroke strut that ends with a pneumatic cylinder that can push a top rod another 5 inches. Picture of the air cylinder is below. The air extension is supposed to activate if the slide is in - the slide would hit the door otherwise. On my coach the air is not active, although the air lines are definitely attached to a solenoid that has power wires going to it. Other discussions indicate it was deliberately disabled by BB on at least some coaches, while others still have working solenoids. It would seem that replacing both sides with 15-inch struts would result in the door always opening fully, which would be a problem. Replacing just the one 15-inch strut might provide enough power, but I don't know which strut, is weak or if both are. Another possibility would be to replace both with 10-inch-stroke units that have the same collapsed length as the current 15-inch side, if that is possible to find. I'm interested in thoughts, and particularly if anyone has replaced any of these. don wow that is a odd duck~!!! Fun-Fun-Fun Till they take the BlueBird Away! good idea,and easy to do. Don, FWIW my 07 has gas struts only, no air. The door extends fully but even with the handle in the open position the door does not quite contact with the slide?? Jim, that would imply that they don't open as far as the earlier ones can, as they definitely will rise above the bottom of the slide. So, can you provide some detail about what the labels on the struts say? Don, I have attached some pictures to show how high the doors go. The struts are 24" loa. I have also attached a picture of the label stamped on the strut. If that doesn't help I can go back out to the coach and write any detail out for you. It is hard to make out some of those digits, but I don't think you need to do more - if I make a change to something like that it wouldn't necessarily have to be exactly the same as yours. The struts on mine are 32 inches total at the horizontal position, 37 inches when fully extended. As you would expect, they are mounted at the very bottom inside the bay, on brackets that put the ends even further into the bay. So, any change of strut length would require calculation of a new mounting position. It turns out that the hybrid unit uses a standard AVM strut, with the tube end threaded into the air cylinder. Now the problem is to find the parts. Blue Bird bought from Austin Hardware, but their site has zero AVM products now. The AVM website appears to not be maintained (some copyright 2007 pages), and lists many dealers that have no AVM products including Austin. I placed a call to them and left a message, but haven't had a return yet. I called Orr&Orr, and they are unable to cross-reference to AVM. He sent me a special order list that that did not have exact replacements, and he warned that it would be pricey. I have to have an M6 thread on the tube end to work correctly and Orr&Orr does not sell any plain-threaded tubes except by special order. If anyone has any ideas on where some AVM struts might be obtained it would be good to know. I need AVM models 1000V and 1500M, both with 80 lb pressure.